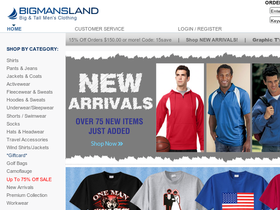 Big Mans Land, online at BigMansLand.com, is your destination for clothing for big and tall men. Big Mans Land sells t-shirts, pants, jeans, jackets, shorts, fleece wear, hats, coats, and activewear. Big Mans Land also carries golf bags, backpacks, rolling suitcases, duffel bags, and scarves. Big Mans Land also offers camouflage gear: including shirts, vests, and jackets. Popular designers including: Reebok, Columbia, Signature Port, Tiger Woods, Hanes, and Jerzees can also be found at BigMansLand. RetailSteal.com has the best Big Mans Land coupon codes, Big Mans Land discounts, Big Mans Land coupons, and Big Mans Land promo codes. Shipping and handling rates at Big Mans Land depend on the pricing of your purchase and your shipping destination. Orders are shipped via UPS, FedEx, or the United States Postal Service. See website for full details, exclusions may apply. Save 15% at Big Mans Land using this coupon code on purchases $150+. Click link to shop and save. Get free shipping on any purchase over $150 while using the coupon code when shopping online at BigMansLand.com. Click to save. Save $25 on order of $150+ when you use this code at at BigMansLand.com. Click to save. Get 10% off your entire order when using the coupon code while shopping online. Click to save. Get 15% off any order over $150 using the coupon code when shopping online at BigMansLand.com. Click to save. Use our coupon code online at Big Mans Land today to enjoy 10% savings on outerwear when you shop online. Get 25% off select merchandise including Reebok activewear at BigMansLand.com using the coupon code. Click link to purchase. Use this code at BigMansLand.com and save $5 on orders from your wishlist of $50 or more today. Click to save. Save up to 75% off select sale items when shopping online at BigMansLand.com. Click to save. Purchase a graphic t-shirt from Big Mans Land and get a second for the low price of only $15.